Pictures are the essence of any trip to a theme park. But Disneyland has added some unique and pretty amazing photo opportunities spread throughout both parks in Anaheim. You might even have passed these hidden treasures by or not even known about them. In celebration of the 60th anniversary, they set up photo stands that feature some surprising optical illusions that don’t require anything more than a camera. Sometimes they have cast members available to take pics for you, but often times, you can take them yourself. And they are a ton of fun. Absolutely love this pic! It totally looks like we are riding Big Thunder when we are really on a bench behind the scene. 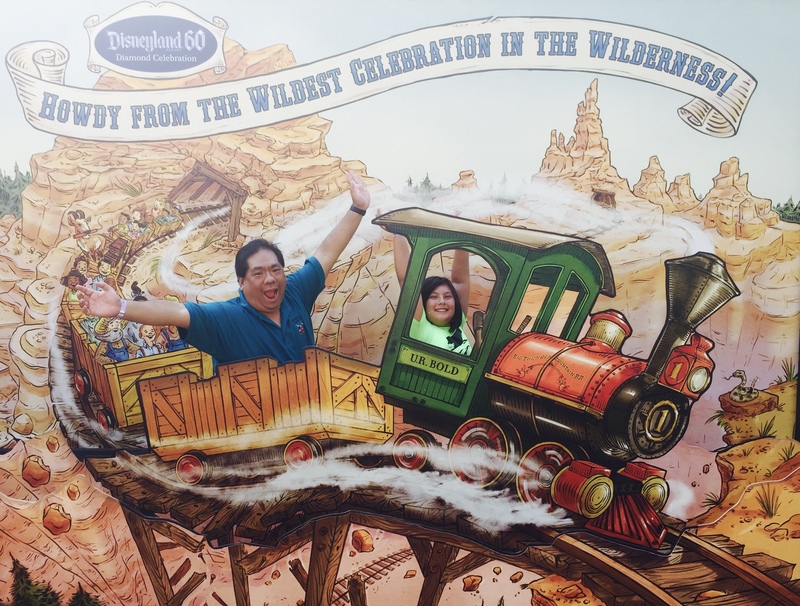 We took this picture before they started doing construction on the area near Big Thunder Ranch where this photo op was located. Emma and I are actually seated on a bench in front of the background with just the two front cars in the foreground along with some of the track and mountain, but because of the way the front portion is situated its hard to tell where they are separated. Instead it looks like we have been seamlessly Photoshopped into the picture. But really it’s just a trick of perspective. 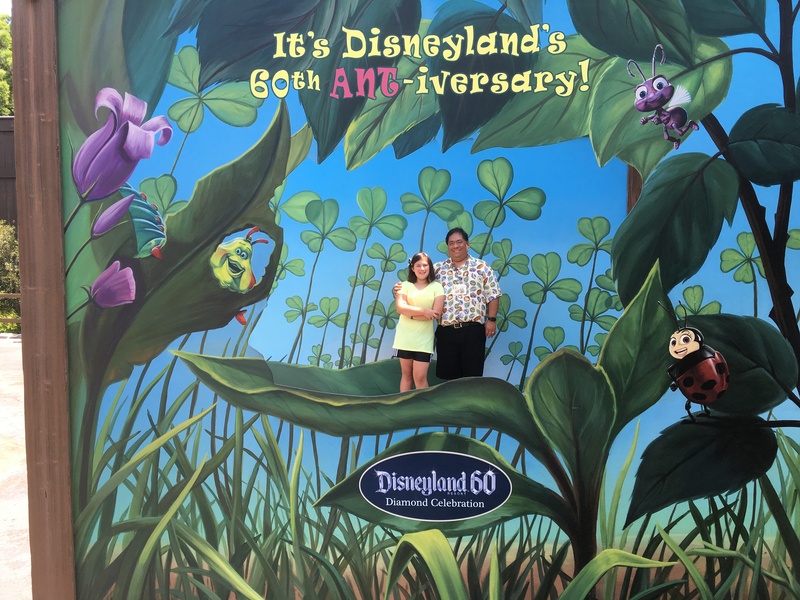 The same is true for this picture of my daughter and I in A Bug’s Land at Disney California Adventure. We were standing about 15-20 feet behind the frame in the foreground, but the background and the foreground frames were in alignment so it gives the illusion that we are super small. What’s impressive to me is how they take into account the distance between the two frames and match the images so that the effect seems somewhat seamless. These simple but effective optical illusions make for fun photos and wonderful memories. But with the 60th anniversary ending soon, the photo frames will likely disappear so if you get a chance, search for these hidden treasures while you’re in the park. Hopefully, they’ll replace them with other creative picture opportunities after the anniversary ends. But even if you miss out on these photo ops, there are other great ways to make special memories. Today, both Disneyland and Walt Disney World have effects they can add to your pictures and they are part of your package if you happen to have a PhotoPass (either purchased separately or as part of your annual pass). We took a picture at Walt Disney World where our daughter put her hands above her head and we held on to her. Afterward, they added a bunch of Mickey balloons so it looked like we were holding her so she wouldn’t float away. There are lots of options like that available. And Disney also offers “enhanced” photos at certain locations complete with animation and music like those above. These hidden treasures can add even more magic to your memories!